DCIM Market Share « Global Market Insights, Inc. The commercialization scale of data center infrastructure management (DCIM) market has been witnessing remarkable upswing in the recent years. The steady rise of this business space can apparently be accredited to the burgeoning complexity of managing large data centers and the limitations with regards to space and power. In addition to this, the robust proliferation of cloud technologies and big data along with the emergence of Internet of Things has necessitated numerous business verticals to focus on planning of physical infrastructure of IT based services. This has consequentially led to DCIM industry gaining tremendous traction over the past few years. In fact, according to reliable estimates, the overall revenue share of this business space is set to surpass USD 3 billion by 2024. In an era when cyber-attacks from ‘nation state actors’ have become an everyday occurrence across the globe, it has been observed that numerous governments are increasingly allocating massive resources to fortify network security. In addition to this, various regulatory authorities have mandated stringent guidelines to monitor and identify potential vulnerabilities in the digital infrastructure of developed and developing nations. Nlyte Software, one of the major US based DCIM market giant, has recently announced to have received the much-coveted approval of the Department of Homeland Security for its DCIM suite. Reportedly, the latest approval makes it the first DCIM solution across the U.S. to adhere to all the stipulations prescribed in the Phase 1 of Continuous Diagnostics and Mitigation (CDM) Program of the federal government. For the record, the U.S. federal government had rolled out a Continuous Diagnostics and Mitigation (CDM) Program a few years back to ensure security and integrity of software and hardware assets of the nation. Apparently, industry experts claim that such approvals would provide advanced tools and capabilities to various governmental agencies to continuously monitor the safety of critical data centers across various nations. 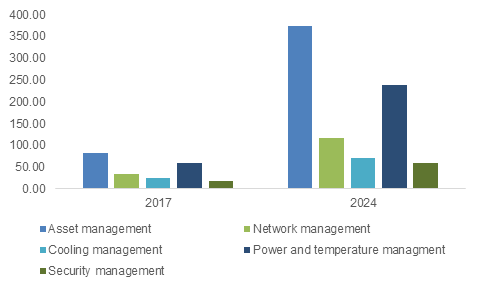 Furthermore, it is quite needless to mention that such encouraging developments would eventually impel the growth potential of the overall DCIM industry in the ensuing years. Elaborating further, it would be prudent to mention a similar instance of governmental initiative that has provided a substantial boost to the firms operating in Australia’s DCIM industry space. The Northern Territory government of Australia has recently declared its Budget for 2018-19 in which it has allocated a total sum of around AU$18.38 million to support initiatives under the Department of Corporate and Information Services. As part of this scheme, the government plans to upscale the number of physical servers from 444 to 460 and intends to increase the number of its fully managed servers from 1600 to 1700 in the next financial year. With such enormous upgradation program in the pipeline, it is quite obvious that prominent firms partaking in DCIM industry of Australia sense an excellent opportunity to deploy their expertise in securing the nation’s data center network. One of the major challenges being faced by DCIM market players has been the responsibility of bridging the complex web of interconnections among a network of data centers. With the advent of enhanced automated tools, highly optimized management workflow procedures, and deployment of real-time monitoring systems, the aforementioned challenges are being gradually surmounted by DCIM industry stakeholders. This trend of improved functionality coupled with powerful IT-based applications would invariably have a favorable influence on the growth prospects of DCIM market share in the times to come. This entry was posted in Electronics and Media and tagged Asset Management, BFSI, Colocation, Component, Consulting, Cooling Management, Data Center Infrastructure Management Market, Data Center Infrastructure Management Market Size, DCIM Market, DCIM Market Forecast, DCIM Market Leaders, DCIM Market Overview, DCIM Market Share, DCIM Market Size, DCIM Market Trends, ENERGY, Government, Healthcare, Installation, Integration, IT, Managed, Manufacturing, Network Management, Power Management, Security Management, Services, Solutions, Telecom.